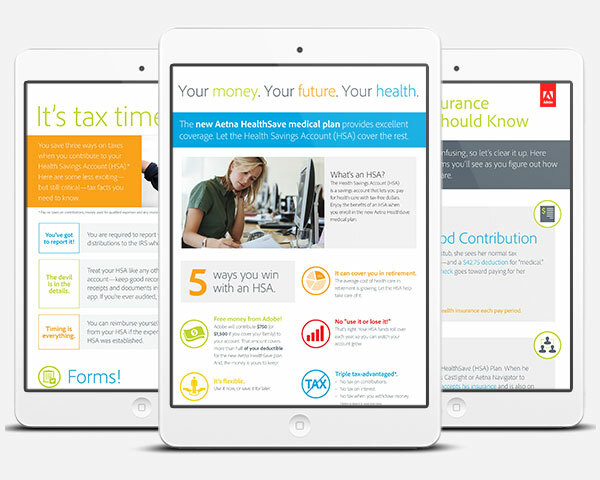 Adobe captures 70% HSA enrollment when smart design-thinking drives plan features, messaging, and a leading edge website. Adobe is a global leader in digital marketing and media solutions, offering a seamless and flawless user experience to its worldwide customers. When the company rolled out its first health savings account (HSA) plan in 2013, it sought to replicate this same user experience to communicate benefits information to its 6,000 U.S. employees. 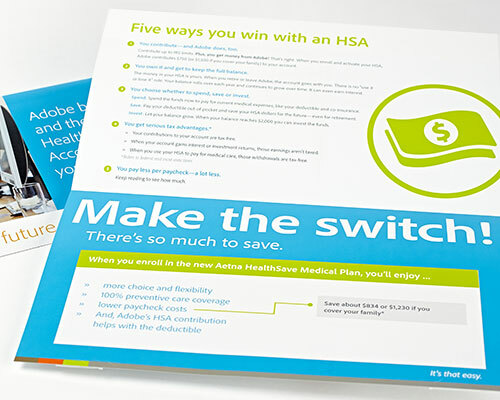 We started working with Adobe that year to develop a communication strategy for the HSA. Key to the success of that strategy were the results from a series of focus groups we designed to gather employee feedback about HSAs. 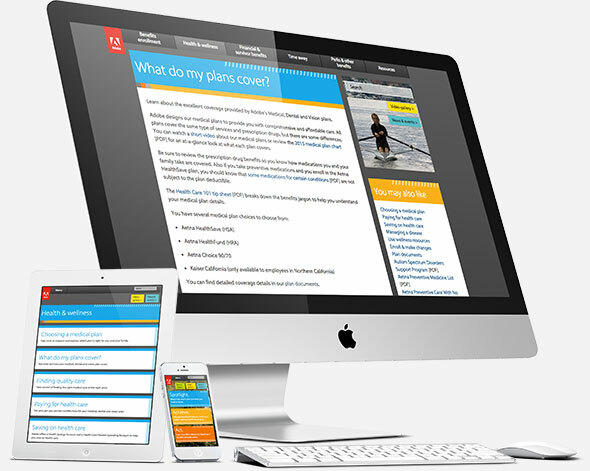 At the same time, Adobe was ready to build an external benefits website. Our team worked with benefits leaders to develop a comprehensive website strategy to support employee communication efforts. That early work led to our current relationship with Adobe, in which Benz supports Adobe’s overall communication strategy for both U.S. and Global Rewards. We partner closely with the employee communication team to support Adobe’s vision for the employee experience, and are scaling this effort for its global offices. We communicate big changes—as well as celebrations—throughout the organization. Our work includes helping Adobe meet their program goals by developing specific and measurable communication plans; partnering with global leads to standardize and elevate communications through writing and design; supporting enrollments across the regions; and maintaining Adobe’s benefits website, which was recently expanded to include seven individual country sites. With its benefits website, Adobe houses up-to-date information about its 25+ plans, 23 vendors and 50+ tools and resources all on one single-stop website—fully accessible for all employees and families, all the time, on any device. With so many messages being sent to employees from across the company, the information we provide needs to be short, relevant and engaging. Of course, being the creative, innovative company that Adobe is, we also needed to ensure that it was easy, intuitive and visually appealing. Clear comparisons of cost, coverage and savings information let employees see how Adobe’s new HSA plan stacked up to existing health plan options. Bold messages drove action: 62% of Adobe’s workforce enrolled in its HSA plan in the first year. An additional 8% enrolled in year two, with 70% of the population now enrolled in its most cost-effective benefit option. Adobe’s success with its employees translated into success for the company. Benefits engagement and appreciation is higher than ever. Also, Rosemary Arriada-Keiper, senior director of rewards, was recognized in 2014 as a Healthcare Consumerism Superstar, presented at numerous industry events and received notable press coverage, including a profile in Human Resource Executive.